When are enough beads too many? It’s always the way. You start a beaded project and partway through you panic that you are not going to have enough beads. Now normally I have this panic (at 2am, startling myself awake), and then discover that I actually have a billion-gajillion beads and end up wondering what I am going to use the remaining 200-500 beads on. But this time my luck has run out. My Garland sweater is coming along nicely thank you very much. I’m most of the way up sleeve one, and when I looked in the pot of beads I thought to myself “there doesn’t seem to be that many beads left”. Mmm. A count of the chart told me I needed 89 beads to finish the first sleeve (and a similar number for sleeve 2). A count of the beads in the pot told me I have 67 beads. Ah. I need to venture into the wilderness and buy beads. Whats the bets I’m incapable of only buying the ones I need? Oh the pretties…. In other news, yesterday I spent some of my Christmas money (yes, in some respects I am still 11) and bought myself a “Zoom Loom“. Oh, gosh. Does that ever sound exciting. Well to me it does, yes. Although the video just has me in fits of giggles – for no good reason, it’s a perfectly clear, comprehensive video. It’s the bit about ‘graceful extended sides’ that does it for me for some reason. Now while the Loom comes with an instruction book, but there’s a whole website dedicated to these little portable pin looms – eloomanation (I know, it’s great isn’t it?!) which has an entire section dedicated to the provision (free) of original 1930-1960s pattern books as PDFs. These of course have triggered all my ‘must-learn-new-craft” buttons. In the style of all vintage patterns out there, these little pamphlets assume that you are a previously unknown shape to mankind (a fitted tunic out of squares anyone?) and that you are a complete genius who’s taking time off from solving the dark matter problem by whipping up a few placemats. I say genius because often vintage patterns assume that you have secret, insider knowledge. Secret, insider knowledge that we couldn’t possibly share with anyone just browsing this piece of literature for clues as to how one might start learning this magic craft. If not I can always go back to that second sleeve! Pull up a chair and make yourself comfortable. Tea? Coffee? something stronger? Bovril? I apologise for being away for so long, 2014 turned into a bit of write off for me, so know it’s done, dusted and hidden under the metaphorical rug we are starting again. I think the best thing for me to do is to pretend that my long absence didn’t happen and we’ll just pick up where we left off. Frankly I haven’t achieved much in that time, craftwise, so you’ll just have to trust me that you are not missing much. 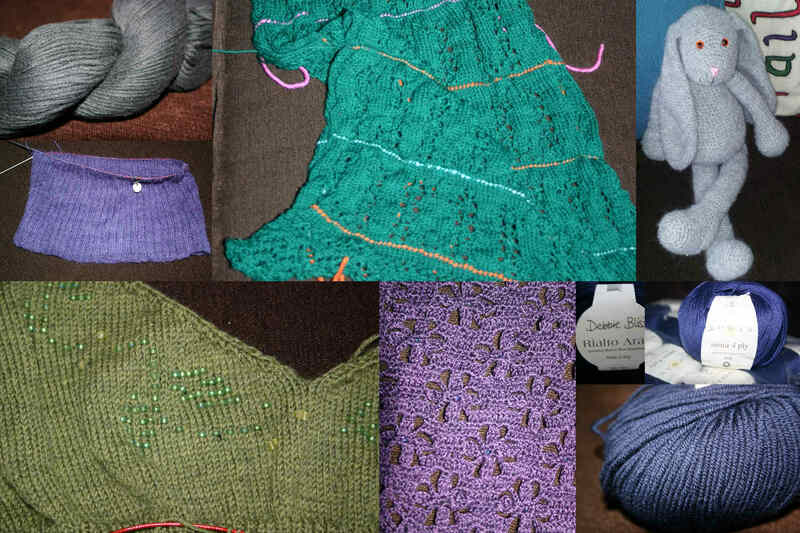 As we start a bright new year I have several WiPs (of course, what a surprise) – I’m still working on Giovanninia, still loving it and the pattern is slowly starting to make sense (6 repeats in and 19 to go…) so is slowly working it’s way up the “I can work on this out of the house” listings. Tirrold is also still ongoing, and I’m still in that 111 rows of 1×1 rib. I also haven’t done much commuting so that had dented knitting time in that respect. 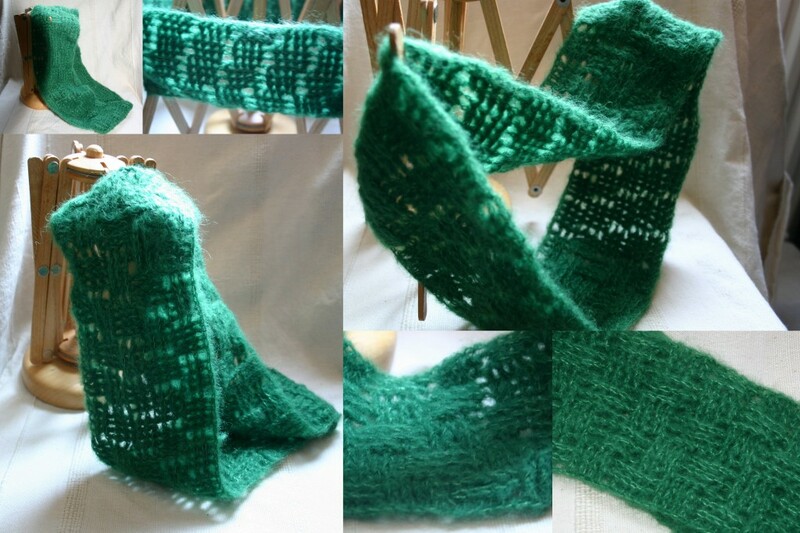 I also started another sweater Garland, a 1940’s inspired design, after I fell in love with the sample at FibreEast 2014. It’s beaded and 4ply – I never make it easy for myself do I? Laura is the one crochet project that is ongoing – in fact it’s in exactly the same place as it was when I last posted in May last year. Naughty girl! must do something about that, but it really requires concentration. The little guy on the top right there ishalf pound bunny, and is one of two finished projects in 2014. The other I didn’t get chance to photograph before it went to it’s new owner. Half Pound Bunny is gorgeous though, and about 1/3 the size of the original one pound bunny. I enjoyed making him, and he’s very loved in his new home. Over Christmas I had the joy to be able to (finally) get round to visiting the wonderful Black Sheep Wools in Warrington. It’s about 20 minutes from my parents, and I’ve been trying to drop in for a visit for the last 2 or 3 years. A massive (compared to most UK yarn stores) warehouse of a place with everything from fun yarn to finest silks (and a tea shop, don’t forget the tea shop!) I may have lost a few hours due to yarn fumes. Of course my visit coincided (accidentally) with their winter sale and I may have had a bit of a blow out. Though to be fair I have bought very little yarn the last two years. I came away with three packs of 10 skiens (oops) – Rowan Siena 4ply, Rowan Creative Linen (dk) and Debbie Bliss Rialto Aran (10ply) – but it is a jumper worth in each case. The 4ply had already been tagged to make Ice by Bernadette Ambergen, a beautiful pattern bought for me by a friend for my birthday. I’m really looking forward to making this, and am having to be very disciplined in not picking up the needles immediately and discarding everything I’ve already got going on. However I resigned from my day job in December, so might be going back to a regular commute rather than a cycle commute – at which point I need something nice and easy for the train rides. The other project I was working on last time we spoke was a pattern designed for the beautiful Cumulus from fyberspates. It’s finished and I’m 99% pleased with it – it’s going through testing before being made available to everyone, so watch this space. It’s exactly what I wanted, light, warm and perfect for halo yarns even though it’s crocheted rather than knit. The one “downside” that I’m working out, is getting a better stretch to the cast on edge. I’ve tried a chainless foundation and (surprisingly) it doesn’t quite work, so i’m having to come at this one a bit laterally.